Thousands of runners set out west on Pequot Avenue at the start of the Pequot Runners' 41st annual Thanksgiving Day Road Race, Thursday, Nov. 22, 2018, in Fairfield, Conn.
FAIRFIELD — Despite an extremely cold morning, more than 4,000 runners ran for charity Thursday at the Pequot Runners’ 41st annual Thanksgiving Day Road Race in Fairfield. “This is by far the coldest it’s ever been on a Thanksgiving Day in my 29 years of directing this race,” said Pequot Runners President Jeff Palmer. 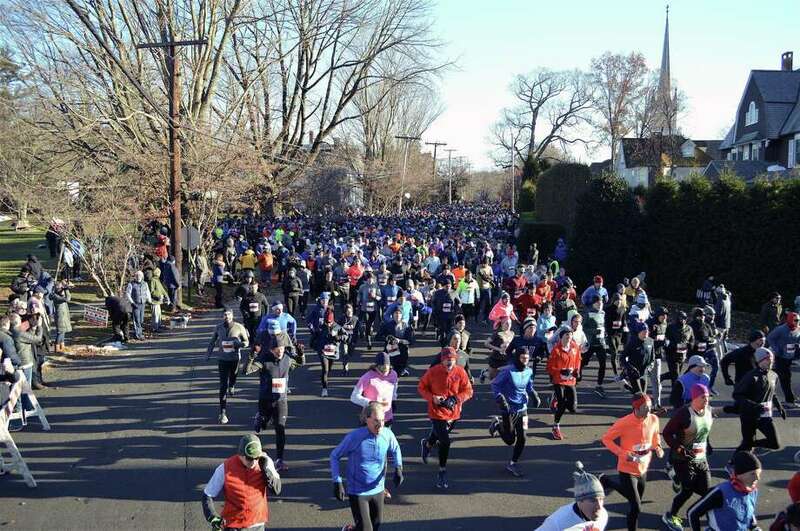 “There will probably be people who wake up and cancel,” he said, with close to 4,400 registered in advance — most for the 5K, which included parts of Westport, and about 10 percent of whom walked a 2.5-mile course instead. Most appeared to show up, with the starting point in front of Pequot Library on Pequot Avenue a veritable river of runners. Profits from the event will be presented to area charities, Palmer said, noting support of various sponsors, including the Hospital for Special Surgery in Stamford. Runners were able to stay indoors beforehand in the gymnasium of the Wakeman Boys & Girls Club. “I’ve run every one,” said race veteran Ramsay Merriss, of Weston, who took part in the first event in 1977. He also said this was the coldest race day ever.